The Japanese Maple, Acer palmatum includes an incredibly diverse and beautiful variety of over 300 cultivars. They vary considerably in leaf shape, ranging from the 'typical' Maple leaf, to deeply cut 'Lace Leaf' hybrids. from a low growing, dwarf weeping variety to a 20 foot tall shade tree. Japanese Maples look as though they would be delicate, but they are hardy and durable treeswhich are seldom damaged by insect pests or by air pollutants. If you live within zones 4 - 8, and have a well drained location in mind, check out the different varieties at a local nursery. 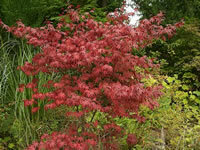 You are bound to find at least one Japanese Maple which perfectly suits your desires and your planting site. The Japanese Maple grows best in a moist, well draining, fertile soil. When they are grown in areas with hot dry sun, they should be grown in partial shade (afternoon shade) to protect them from scorching. In northern areas, where summer temperatures are more moderate, they will do quite well in full sun. Dwarf varieties (and to a lesser extent, the tall, upright forms), can be easily and successfully grow in large containers or planters, provided there is good drainage. Fertilize Maple Trees in early spring by punching a series of 1"-2" holes at the drip line, 5"-6" deep, and two feet apart. Fill each hole half way with a good all purpose (10-10-10), slow release plant food. ALWAYS water trees and other plants thoroughly after fertilizing. Plant Japanese Maples in the spring after the danger of frost has passed. It may be necessary to provide support stakes to prop up young slender branches until they have developed and strengthened, because the weight of the new foliage may tend to cause the branch to droop to the ground. 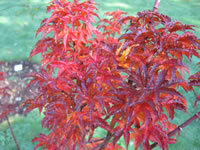 Japanese Maple trees have tendency to leaf out very early, which unfortunately makes them susceptible to spring frosts. A late frost may result in a loss of the new foliage, but the tree generally survives without any damage. Prune Japanese Maples in late fall or winter, while they are dormant, removing any dead or damaged branches. They adapt well to pruning and are easily thinned and sculpted to accentuate their graceful shape. You may prune further to control the size, or create the shape which suits your landscape needs. and may not necessarily duplicate the parent plant's coloration, or even growing structure. 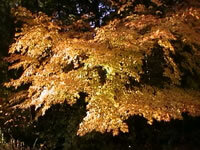 Japanese Maples can be easily transplanted (even larger specimens).